CANBERRA, Australia, August 9, 2016 (ENS) – An acidifying ocean absorbing too much carbon dioxide from the atmosphere could have a major impact on phytoplankton – the staple diet of krill – with serious repercussions for the entire Antarctic ecosystem, scientists from the Australian Antarctic Division have found. 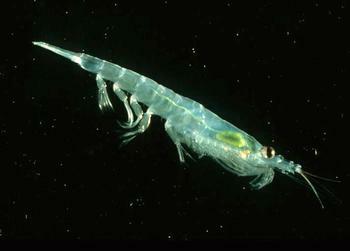 Krill are tiny crustaceans. They are the keystone species of the Antarctic ecosystem and the staple diet of many animals, including seals, whales, fish, squid, penguins and flying seabirds. Chief investigator marine microbial ecologist Dr. Andrew Davidson and his team of researchers issued that warning today after years of studying the effects of ocean acidification on communities of bacteria, phytoplankton and protozoa. Ocean acidification is the ongoing decrease in the pH of the Earth’s oceans, caused by the increasing uptake of carbon dioxide (CO2) from the atmosphere. See an infographic illustrating the process. Since the mid-1700s, industrial and agricultural activities have increased the amount of CO2 in the atmosphere. The ocean absorbs about a quarter of the CO2 humans release into the atmosphere every year, so as atmospheric CO2 levels increase, so do the levels in the ocean. The experiment was conducted at Davis research station on Antarctica’s east coast, one of three permanent bases and research outposts managed by the Australian Antarctic Division. The results, published in the “Marine Ecology Progress Series,” show a rapid and significant change for phytoplankton when it was exposed to the carbon dioxide (CO2) levels predicted in seawater by the end of the century. “We found that phytoplankton decrease in number and size when exposed to levels of carbon dioxide (CO2) above approximately 750 parts per million (ppm),” Davidson said. “The abundance of large phytoplankton bigger than 0.02 mm decline, and we saw an increase in phytoplankton smaller than 0.005 mm,” he said. Davidson explained that marine microbes such as phytoplankton may be very small but they are vastly abundant, the sole source of plant material for the Antarctic food web. They also help mediate the global climate. “Krill only graze on phytoplankton bigger than 0.006 mm, and as the staple diet of many animals, any impact on krill will have serious repercussions,” Davidson warned. Dr. Davidson said a decrease in larger phytoplankton would also impact the global carbon cycle. “Phytoplankton incorporate CO2 into their cells during photosynthesis and the cells, usually the large ones, sink to the ocean carrying the carbon with them,” he said. By storing CO2 in the depths of the ocean, phytoplankton help mediate the concentration of the greenhouse gas in the Earth’s atmosphere. “Smaller phytoplankton cells will sink slower and often the smaller cells will be consumed by protozoa and bacteria – which release the CO2 back into the atmosphere,” Davidson said. Davidson said the experiment at Davis research station was refined and repeated in 2014/15 summer. Preliminary results reinforce the previous findings.